This Corliving TV stand is sure to fit any floor plan. Easily support your television with this black free standing TV stand. Use this piece as a handy place to store movies, gaming consoles, and even speakers. Your television, not cables and clutter, should be the focal point of your family entertainment center. Achieve that easily with this chic, black TV stand. Built with durability in mind, this stand offers you the peace of mind knowing your television is supported with strength. Four drawers provide space to neatly organize movies, remote controls, gaming consoles and controllers, and more! Available in black with silver accents and hardware. Whether you are decorating a brand new condo, house, or apartment this two tone modern style 60"L TV stand will be the center of attention! Finished in an industrial chic grey cement-look top with a black base finished in the front and back, this TV stand can accommodate all TV sizes with a center stand. It features thick paneling with 2 storage cabinets and a long center drawer for your gaming or technical accessories, all accented with sleek silver metal handles. The open shelves are great to place a DVD player and other audio/visual components. Keeping it all neat and tidy is the convenient wire management hole in the back. Assembly is required. Modernize your space with this contemporary style TV console. Featuring a solid 60"L top and a tempered glass shelf along with a bottom shelf to place your audio/visual/gaming components or decorative objects. This durable console designed with retro style rounded edges and finished in a sleek glossy black, fits perfectly in a living room, den, or basement to showcase your latest high tech gadgets. 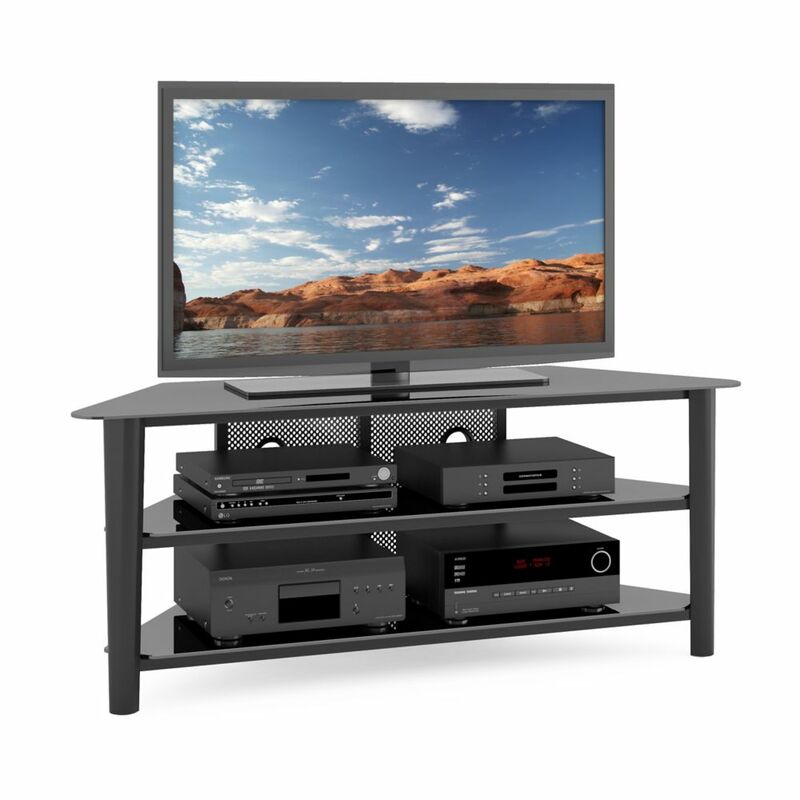 Alturas 60-inch x 24-inch x 18.5-inch TV Stand in Black This Corliving TV stand is sure to fit any floor plan. Easily support your television with this black free standing TV stand. Use this piece as a handy place to store movies, gaming consoles, and even speakers.